It’s a strong claim, but I truly believe jumpsuits are going to be one of the hottest, if not the hottest, trends this season. They are cute, comfortable, and provide a more casual and last minute option than a dress does! Today I’m sharing with you guys one of my new, favorite jumpsuits! If you follow me on my Instagram (if you don’t, you should check it out here), you’ve probably noticed I’ve been posting quite a few jumpsuits. Honestly, I can’t get enough of them! I’ve always been a huge dress person too, so for me to start liking jumpsuits more is crazy! I just love the versatility of a jumpsuit. If you’re going to an event that you don’t know whether it’s fancy or casual, jumpsuits can go either way. It’s not as casual as jeans, but not as fancy as a dress. They’re also usually much more comfortable and require a lot less shaving prep (if you’re lazy like me). Shein recently sent me this adorable blue, floral jumpsuit, and I’m obsessed! It’s definitely one of my new favorite jumpsuits and Shein items I own. This jumpsuit currently costs $27 and is available in both this gorgeous blue color and a coral color. I am also absolutely in love with this color. It’s such a unique color, and it’s absolutely perfect for the summer seasons coming up! This jumpsuit is PERFECT! The material is light, airy, and super comfortable. I can definitely tell this jumpsuit is going to be grabbed a TON coming up, and I would definitely recommend picking this up! I paired this jumpsuit with a pair of white Charlotte Russe Heels, which are currently on sale for $21.59 and a Forever 21 Pendant Necklace. I just wanted to keep the accessories simple and cute with a summer vibe for this look. Anyways, that’s all for today’s post! Thank you all so much for reading today’s post. I truly appreciate every one of you! Feel free to leave a comment if you enjoyed this post, as it gives me a better idea on what you want me to write about next! Bye loves! 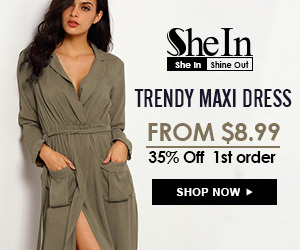 Disclaimer: This blog post is not sponsored but does include affiliate links and products sent complimentary to review (Shein). All opinions are my own. If you are interested in purchasing any of these products, please consider purchasing through my links, as this does help me to purchase more products to shoot and review for my readers. I love this jumpsuit! Those heels are perfect too!! This jumpsuit is so cute. It’s looks perfect for summer!